It’s been far too long since I wrote a food post. I’ve been in a major recipe rut for months now, and having to be on a low-carb diet hasn’t helped the cause any. 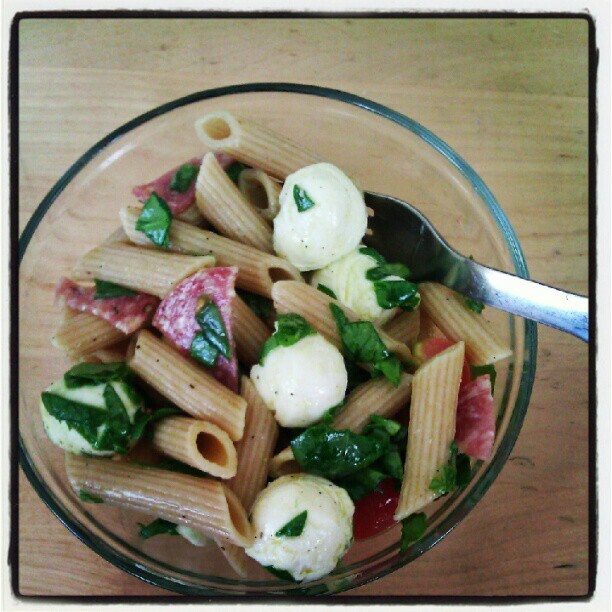 But, I felt inspired today to post my favorite, favorite, favorite pasta salad recipe, for a couple of reasons. 1. Us San Franciscans are just beginning to enter our real summer, which comes a bit later than it does for the rest of the country. September and October are our hot, sunny, stellar months. We’ve had some good days so far this August too. And we’re rockin’ it. So, it’s time to whip out the “summer” recipes–i.e. those that don’t involve the oven and/or are served cold. 2. Every time I make this salad, Bowie enjoys it a little bit more. The last time I made it, he gobbled up every last drop. If you know my son at all (or have read my Twitter account on any given day) then you know he is about the pickiest eater there is. Won’t try a new thing ever. ESPECIALLY if it’s green. But he eats every single morsel of this salad. Once you see the ingredients, you’ll understand why this is so noteworthy. So, parents of picky eaters: read on. You’re likely wondering how I can include a pasta salad in my diet when I’m supposed to be keeping it low-carb. First off, I use whole wheat pasta, which is better for the ol’ blood sugar than regular white pasta. Secondly, I can tolerate more carbs later in the day, so right now I reserve this dish for dinner. Thirdly, it helps to eat the pasta in conjunction with the other ingredients. And finally, our old friend portion control. Mix all the salad ingredients together in a large bowl. In a small bowl, whisk together the dressing ingredients. Give it a taste and adjust based on how you like it. Put it on the salad and toss well to mix. It helps if this sits in the fridge for a half a day or so to let the flavors mix, but totally not necessary. That’s it. Simple to make, easy to find ingredients, nice and light for those hot summer nights. And the leftovers keep for days. Yay for easy lunches! Happy eating! And happy pleasing your picky kid!